70 steps from the water, Monkey Lala is a 3 bedroom 2 bathroom beach house located in West Bay Village an oasis of privately owned homes on West Bay Beach. Just a moments stroll from bars and restaurants. Tucked away, this hidden gem is private and convenient, this location is unbeatable, close to the amenities of West Bay Beach yet secluded and private surrounded by lush tropical gardens. Just 200 meters off the beach you will encounter amazing snorkeling & diving, exploring our reefs could not be easier! This upper level features two bedrooms, the master with new King bed and the guest with two twins can be configured as a King. Spacious bathroom with shower & tub. A fully equipped kitchen and dining area, large living area with high, lofty ceilings has fabulous barn style doors opening onto the covered latticed deck creating an incredible indoor/outdoor living space surrounded by tropical palms and flowers. With tables, chairs and a hammock, this outside living room quickly becomes the center of the home. Available for rental with the Monkey Lala Studio giving you 3 bedrooms & 2 bathrooms. Fernando and Sheila were amazing and very friendly. The staff, from the cleaning ladies to the grounds keepers and security were very hospitable and helpful. A home in paradise. A kind African Caribbean culture that reminds us of traditional good food and meso-american history. The best Caribbean food (conch soup and pescado frito) and baliadas (a local favorite). Best beach for relaxing and snorkeling. Safe, beautiful and family oriented. REPLY: Thank you for your great review, we hope to have you back! From the moment we arrived, our check in was simple, quick and easy, our neighbors were WONDERFUL, the security guards were lovely, the area was sprayed for mosquitos and we were really comfortable the entire time. Location was perfect, water taxis were steps away from our place and the snorkeling was out of this world. Missing Roatan and our monkey lala upper home. REPLY: Thank you for such a great review! We hope to have you back to your Monkey LaLa Upper home soon! From the moment we arrived, our check in was simple, quick and easy, our neighbors were WONDERFUL, the security guards were lovely, the area was sprayed for mosquitos and we were really comfortable the entire time. Location was perfect, water taxis were steps away from our place and the snorkeling was out of this world. Missing Roatan and our monkey lala upper home. Island House staff is always available and willing to lend a hand with whatever request you have, weather for a problem, information, or reservations. I have been to west bay several times and I am happy to say that this stay was great. I have done surveys before and let them know of a problem. It was nice to see that the problem was taken care of. Only comment would be less vendors approaching on the beach while you relax. This is not directly related to the west bay village but more of an island issue. Other than that it was a great trip. REPLY: We're glad to hear you continue to enjoy your stay with us! We are hopeful the new incoming mayor will be helpful with the beach vendors. very friendly and always ready to help you. An excellent place to share with family and friends, will not change this place for any other hotel. REPLY: Thank you so much, we look forward to having you back! The house is really nice, the kitchen complete, we really enjoyed our stay. REPLY: We're happy you enjoyed your stay with us, we hope to have you back again. I would add air condition to kitchen and living room. Towells were poor Quality RESPONSE: Thank you for your comments, we have passed them along to the owner and expect both areas to improve promptly. Ryan was great to work with and our driver that picked us up at the airport was great. Perfect Location! 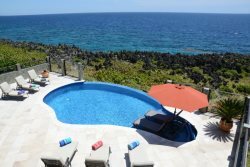 My husband and I went to Roatan for a "date-cation" and we couldn't have picked a better place to stay! Monkey La La was cute and clean. I loved the front porch for breakfast and walking the sandy path to the beach. We would definitely stay here again! The "upper" apartment of the Monkey Lala House is everything that we could have wanted in a vacation beach house! The decor is very tasteful and relaxing (rather than some "beach" themed decor that can be absolutely dreadful in some beach houses!!). The king bed is so comfortable, the AC in the bedroom works great, great bathroom. Combine the ceiling fans all over the house, being upstairs on the second level, and opening the beautiful barn doors to the porch and you are sure to catch a good breeze. The house is in a excellent location (within a short walking distance to the beach, stores, a great spa, and excellent restaurants) and don't let this house not being on the beachfront keep you from staying there. It's still so close that you can skip back to the house from the beach whenever you'd like. Honestly though, my favorite part about this house was pleasant little surprises of everything we wanted or needed already being there - water bottles, ice packs, matches, books, games, beach towels, tupperware, mosquito repelling incense, even cooking spices! If you plan on doing any cooking, which we did, the kitchen is well stocked with any item you might need, including good knives, serving platters, pitchers, everything. Thank you for a great stay where I didn't have to worry about anything! Ryan mi concierge es muy atento y simptico me ayudo mucho, yo tuve una gran experiencia con todos ellos y los recuerdo con mucho cario, definitivamente espero volver pronto. Gracias por todas sus atenciones. Una de las mejores vacaiones de mi vida. Hola, yo estuve hospedada en Monkey Lala Upper, es una casa adorable, cmoda y muy linda, tiene todas las comodidades para sentirte en casa, la ubicacin es excelente a unos pasos de la playa, toda la gente es muy amable y atenta, Dolores la camarista es muy amable. Monkey Lala rocks !!!! The house was a dream !! Much better than what we imagined from pictures at the web site. Comfortable, well provided, decorated with taste and lots of local pieces of art and crafts. Thoughtful owners expected us with very much appreciated gifts upon arrival, thanks guys for the beautiful flowers and the cold Barenas!!!!. Definitely we will recommend the Monkey Lala as "the place" to stay when visiting Roatan. Way much better than one of the resorts or condos next door. Great beach vacay! We are here now and it couldn't be any better!! Great location and great beach!! Great beach house!! Close to everything but still plenty of privacy. Clean and comfortable. Would defiantly recommend and already planning to come back!! This is the second time we've stayed at West Bay Village and it won't be our last. Brad is so welcoming and accommodating for our last minute vacation requests. Location and beach is the best. Cruise ship days can be busy but security on the property keeps them away from our beach keeping it private. Previously stayed at Mary's Place, this time stayed at Satori and Monkey LaLa upper. Both were spotlessly clean with everything you needed. Satori is brand new and very modern, loved the fact that it was ground level and just steps to the white sandy beach, Monkey LaLa upper felt like we were in a tree house, high ceilings, dark wood - very different, we loved them both. Weather wasn't the greatest but that's something that you can't control. The last 2 days were beautiful, hot and sunny, making us forget about the rainy days. We'll be back to West Bay Village! Rate is for 4 persons. Posted rates do not include 19% Honduran tax, but 'instant quote' will. Maid service once weekly is included. Security deposit of $1000 is required.